If you haven't heard about my AWESOME giveaway, click here! You might win one of these shirts PLUS 3 items from my TpT store! I have been so blessed by each of you that stops by my blog. Your heart notes encourage me and make me smile! I am so excited each time I open my emails. I am honored you would use my activities to teach your kiddos. I hope you leave my blog with some encouragement. This is too cute! I will be printing it out to use in January. That you so much for your generosity! I love your poems. It is always a reminder of why I teach. Thank you for all you do. I LOVE it!!! Thanks so much....I'll be using it very soon in my classroom:) Merry Christmas! 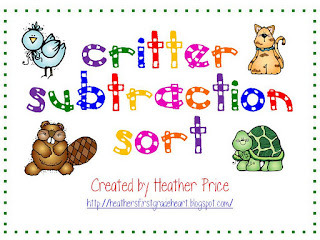 Thank you so much for the subtraction game! I gave my kids the Christmas addition one yesterday and they absolutely thought it was the best thing! Thank you for sharing, you are so generous! These are so great! Thank you for sharing your awesome free materials. I found you at the Teaching Blog Addict. I am a speech pathologist, blogger and mama of two and I host a linky party, Thrifty Thursday, to bring together educators and parents to share FREE or nearly free learning activities. I'd love for you to stop by, and link up if you'd like! Thank you so much for sharing! I LOVE LOVE LOVE! Heather, Thank you thank you for following me, entering my giveaway, and sending me your way! I love your blog and can't wait to sit down and read away when I can give it my undivided attention! I just know I'm going to learn amazing things from you! Another Creative Activity for my students! Thank you so much for sharing! So glad to have found your blog. This fact sort is perfect for my class. Thank you for sharing.